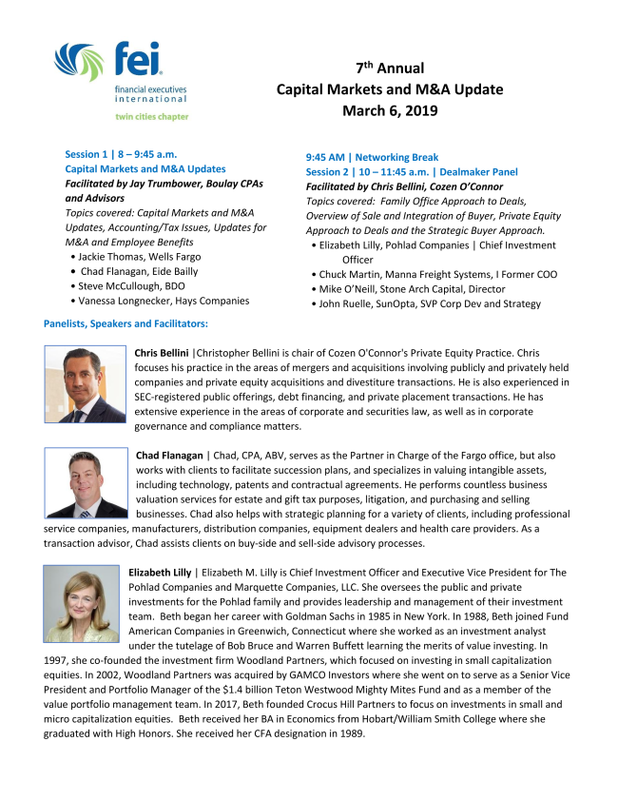 We are happy to hold our 7th Annual Capital Markets/M&A Update session on March 6, 2019 at the Minneapolis Golf Club in St. Louis Park (please note the NEW location)..
Bring to this session the challenges you are facing or seeing on the horizon as we expect engaging conversation. This session will be very interactive with questions from the audience, panel members and moderator. Topics covered include a capital markets and M&A update, accounting and tax updates and employee benefits issues in due diligence and integration. Topics covered include the family office approach to deals, an overview of a recently completed sale and integration process, private equity approach to deals and the strategic buyer approach to deals. CLICK HERE (or the image below) for a printable schedule and bios of the panelists, speakers and facilitators. How to work through a HR Benefits transition and integration process? Session 2 will focus on the many aspects of dealmaking. Come early and stay late for some networking as well!